How you live your life is your true spiritual practice. People have an innate desire to be in service, but without a fully developed sense of personal responsibility and compassion their service is at risk of being abused or worse. 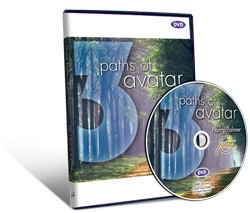 In this DVD package Harry Palmer, author of the Avatar materials, examines the relationship of these three qualities of life: personal responsibility, compassion and being in service. The Path To Personal Responsibility: Taking personal responsibility for your life is a necessary process. The power in personal responsibility is that external causes no longer produce internal reactions. Personal responsibility restores your choice as to how you react to people or events. The Path To Compassion: Rather than being at odds with each other, head consciousness, or intellect, and heart consciousness need to work together. The Path To Service: How you live your life is your true spiritual practice. And one of the most profound practices is the giving of selfless help. Something very high, and spiritual, and mystical awakens within us when we help. These talks were recorded live at the November 2009 International Avatar Course and the December 2009 Avatar Master Course. "When consciousness orients itself with the heart instead of the brain, people change. Doing feel-its is an orientation to heart consciousness. We touch our head to signal an intellectual process, but when we touch the heart region, it signals a spiritual process. The head is intellect: it communicates with words and emotional reactions, and its basic motivation is to solve problems and deal with fear. But the heart is spirit: it communicates with empathy, feel-its, and its basic motivation is to connect, to contribute, and to express love. The intellect focuses on matters of survival and social status; the heart focuses on ethical matters and compassion. The self of the intellect is the ego; the self of the heart is the spirit, or higher self. The connection between head consciousness and heart consciousness, or between ego and spirit, is called the path of compassion. Head is "me" consciousness; heart is "higher self" consciousness. Head is reason; heart is feeling. Head is mortal; heart is eternal. Wholeness is experiencing the connection between these two extremes. A person operates most successfully when he or she has deliberate access to both of these modes of consciousness. Head without heart is brutish and selfish; heart without head is naïve and reckless. But together, they inspire people to ethical sane behaviors. The integration of head and heart give rise to a moral conscience. Heart directed by head, and head restrained by heart, are optimum conditions for creating an enlightened planetary civilization." Chinese, Dutch, English, French, German, Hebrew, Hungarian, Italian, Japanese, Korean, Polish, Portuguese, Spanish and Swedish. For people seeking to create a better world for everyone. For people looking to better understand themselves and their relationship with the world around them.